By TruePublica: London’s Metropolitan Police have upgraded their biometric capabilities with a new mobile fingerprint scanning system called INK (Identity Not Known) Biometrics. The system operates on an Android smartphone and relies on a Crossmatch fingerprint reader with a government mass biometric database. The system is now being rolled out across the country and demonstrates the scale of government held biometric data. The Met Police has come under some public pressure recently over its use of facial recognition technology for surveillance for all sorts of reasons, not least that the mismatch rate is so high, thus causing false potential arrest and stop and search events. On the plus side, the scanners interface with the Home Office’s Biometric Services Gateway (did you know there was one?). The INK Biometrics scans will then search for matches against criminal databases within 60 seconds, allowing police work to proceed more efficiently, and ensuring that criminal suspects are not needlessly hauled into police stations for criminal records checks. On the negative side, the Met says that the devices will automatically delete all fingerprints scanned as soon as a given user logs off, helping to protect citizens’ privacy. However, the police have been hauled up so many times for breaches of data protection, privacy and civil liberties – this statement simply cannot be believed without question. In addition, while the government says it will delete fingerprints once taken from its biometric services system, the Home Office especially has been caught up in all sorts of legal battles due to its completely illegal architecture of state surveillance over every man, woman and child living in Britain. By February this year, the system was already available to 5,500 frontline officers, with a rollout to encompass 20 police forces across the country by the end of the year. To help soften the biometric scanner story, the police have stated that the fingerprint scanner could “identify someone experiencing a medical emergency and make contact with their next of kin.” That begs the question, just how many fingerprints of innocent citizens does the government have? And why do they have them if people are innocent of any crimes? 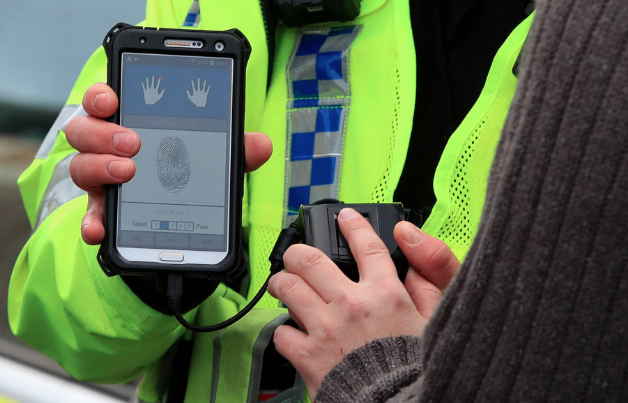 The introduction of these fingerprint devices is a significant step forward for West Yorkshire Police and marks another milestone in our technological ambitions. We have seen first-hand, for instance, how this rapid identification has enabled speedy and accurate medical treatment based on the records available. Its use also allows relatives to attend hospital to see their loved ones when time is of the essence. What technological ambitions they may be is unknown and one assumes from this statement that somehow a police officer now has access to the medical records of any random individual it comes across. How is that possible as there is not supposed to be a centralised biometric database of every citizen and the police do not have access to personal medical records. Or so we have been told anyway. “The growth of border-style security on our streets should be cause for concern to all of us. That police can now stop and scan people’s fingerprints to check their immigration status is the modern equivalent of being asked to show your papers. There is no doubt that the police need sophisticated technical systems to combat crime, arrest the bad guys and be both efficient and cost aware in an era of austerity. The trouble is, every time the government, its agencies – including the police, get caught up in breaches of the law such as privacy and data protection, lost data and hacking incidents, public confidence drains away and is replaced with suspicion.